The Grants to Green Maine program lets the groups spend less on energy and more on their missions. Remember “The Wreck of the Hesperus,” Henry Wadsworth Longfellow’s famous poem about a schooner sailing a wintry sea? That’s the one with the gale from the Northeast, the falling snow “hissing the brine,” the wind a “stinging blast” and the skipper and his little daughter turned into frozen corpses, “all stiff and stark.” Cheery stuff. Maybe that kind of evocative language is what comes of growing up in a chilly brick building in Portland in the early 19th century. Longfellow’s family home, now the Wadsworth-Longfellow House museum, is one of the historical buildings that a program called Grants to Green Maine aims to help with energy issues. In downtowns throughout the state, the program provides matching funds for energy audits and retrofitting to fix windows and air leaks, and slice an oil or electricity bill in half. Gordon Chibroski/Staff Photographer Anne Ball inside the Maine Irish Heritage Center in Portland. 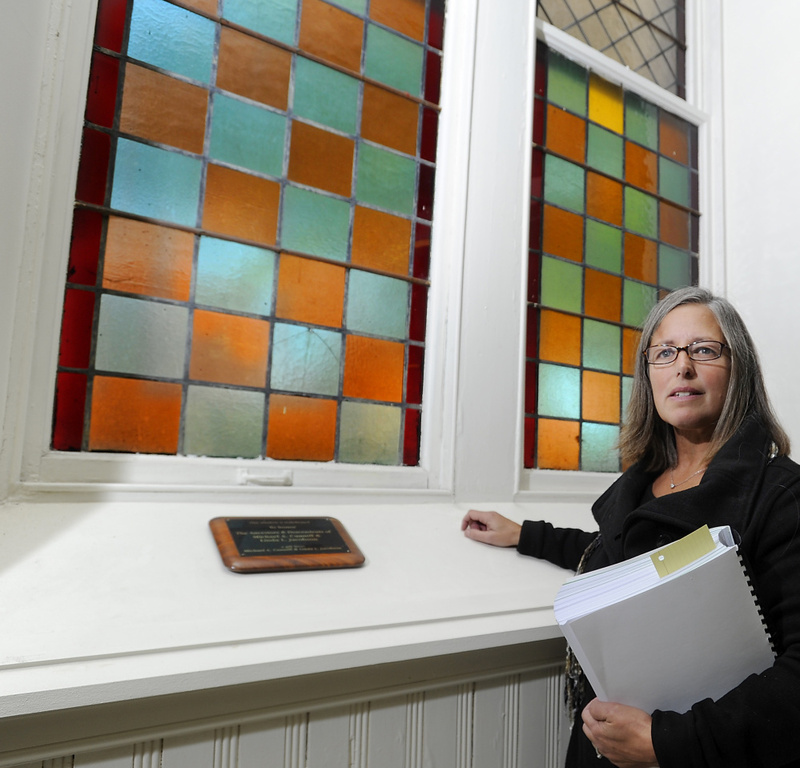 An audit of the building – formerly St. Dominic’s Church – found air infiltration from broken exterior storm panels and missing sealant on the first-floor stained glass windows. We called up Anne Ball, project director for Grants to Green Maine, to find out where the funding came from and where it is going. We also learned what a Green Champion is and what all this has to do with Hot-lanta. HOW MANY ORGANIZATIONS DOES IT TAKE TO SCREW IN AN LED LIGHTBULB? Grants to Green Maine represents a partnership of three entities, the Maine Development Foundation’s Maine Downtown Center, Efficiency Maine and the Maine Community Foundation. All agree that thriving downtowns are drivers of local economies and that heating historic structures is harder than dirt in Fort Kent on a February morning. Grants to Green Maine is funded by a $1.25 million grant from the Kendeda Fund of the Community Foundation for Greater Atlanta. Yes, that is a lot of names. The Kendeda Fund, which the magazine Inside Philanthropy described as “one of the most active and influential mid-level environmental funders” was founded by Diana Blank in 1993. It gives grants of between $40 and $50 million annually. HER TASK: Getting the energy people to understand the historical perspective and the historical people to understand the energy talk is a key part of her job. Like why it matters so much that those drafty windows be rehabbed instead of replaced. “I always joke that I am kind of like the peacekeeper because I try to get everybody to understand each other’s languages,” Ball said. HOW TO? Nonprofits can find out if they are eligible usually about two days after submitting an application. The building must have historical significance (not just limited to established historical landmarks), belong to a 501 (c)(3) nonprofit and have at least one full-time or two part-time staffers (damn, our house isn’t going to qualify). One grantee so far is the Sarah Orne Jewett House Museum and Visitor Center ($2,000 for an energy assessment and audit) in South Berwick. The Portland Museum of Art is scheduled to have an audit soon, as is the Wadsworth-Longfellow House, now open from May to October only. CORRECTION: This story was updated at 8:53 a.m. on Monday, Nov. 23 to clarify the origination of the Kendeda Fund.